Spring really seems to be taking the time in arriving this year. We've had more downright cold and rainy days than moderately sunny and mild ones, and just when I think I should be craving more bright and light food, I'm drawn back to rib-sticking, carb heavy, comforting things. Not that I ever need an excuse to bake. Even in the hottest part of the year, I brave the lighting of my oven. No matter the season, baking is akin to life-giving breath for me - especially in the sourdough department. Quick bread making, however, seems to dwindle in the summer months, becoming much more of an occasional task than a weekly one. 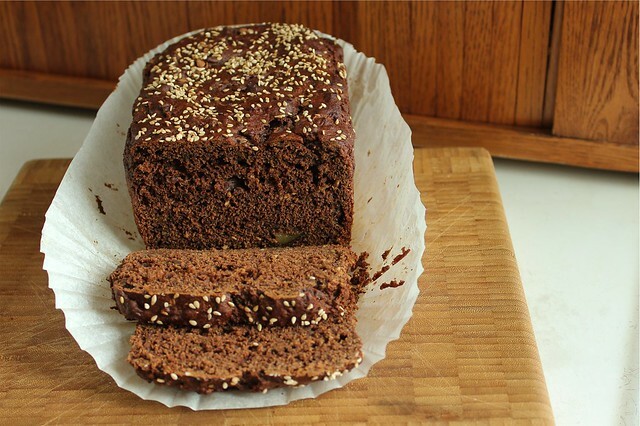 I was thankful for a rainy day yesterday to sneak in another quick bread before the world heats up, one that was more of a tea cake baked in a loaf form and healthy enough to be breakfast if so desired. I had been thinking about making something with tahini all week, remembering this piece that Deena wrote recently highlighting it. I love sesame, but never really have tahini on hand. It seems that my co-op only stocks unhulled sesame seeds, which turn into a fairly bitter butter when ground and processed in the Vitamix. On a recent shopping trip, I discovered they had packaged tahini themselves and I couldn't resist picking up a little container even though it goes against my grain of making things myself. During the week Deena sent me more tahini links, and I was almost sold on this one for flatbreads rolled with sweetened tahini. 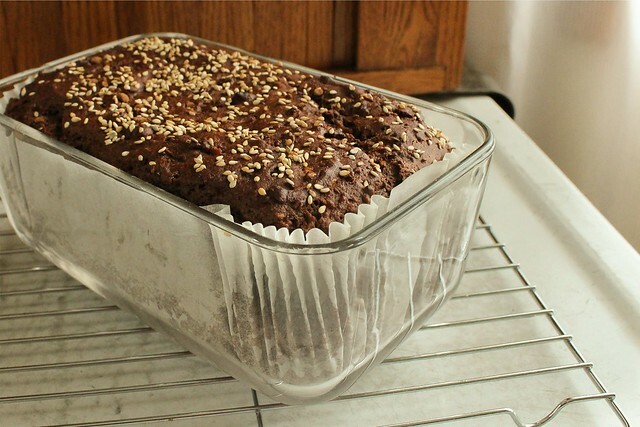 But couldn't shake both the feeling that I needed a quick bread, AND a little bit of chocolate. I certainly didn't expect to hit that sweet spot on the first go, but I did! A perfect concoction of not-too-sweet, reasonably healthy, and just a tad elegant. I used loaf pan liners that my parents brought me back from a trip they made to the UK. They are smaller than the standard 9x5 or 10x4 loaf tins I have, but fortunately a friend gave me a couple of Ziploc brand (they said "made in Italy" on the labels) glass loaf dishes. They come with plastic lids for storage - and I love making loaves in them because it's like I have built in storage after baking. This recipe fits perfectly into the 2 lb. loaf mold, it will likely bake faster and look a little more shallow if using a different sized tin. I might actually seek out a metal tin this size, since I like a smaller loaf cake or quick bread that has some height to it. I made this cake by weight - approximate amounts for conventional measure are also given. Preheat oven to 350. 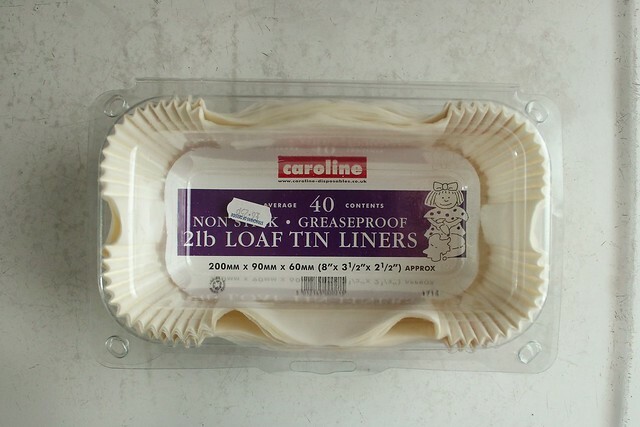 Prepare glass loaf tin with a liner or butter generously and flour well. Sift cocoa powder, ap flour, baking powder, baking soda, and salt together in a large bowl. In a medium sized bowl, mix the remaining wet ingredients. Add the well mixed wet ingredients to the dry and use a spatula to fold together until just mixed and no dry areas remain. Fold in 2 T. of the sesame seeds, and mix just to distribute evenly. Transfer mixture to prepared loaf pan, and use a knife to smooth the top evenly. Sprinkle with remaining 1 T. sesame seeds. Place in the center of the oven and bake for about an hour until a tester comes out clean. Remove from oven to a wire rack, and cool for 45 minutes before removing the bread from the loaf pan to continue cooling. Try to let the bread cool completely, about 2 hours, before slicing. This bread has such a nice texture, almost "puddinglike" in the way that some British puddings are steamed and then marvelously moist-centered. 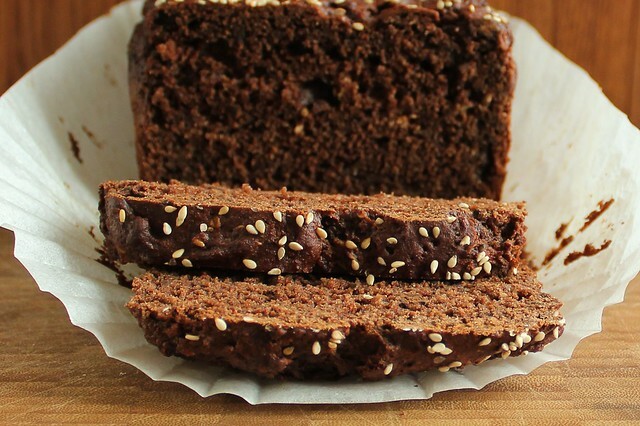 It has a satisfying sesame flavor, that if you wanted could be further complemented by spreading a slice with equal parts tahini and sugar (or honey), but that wouldn't really be necessary. It's good enough to enjoy a fat slice alone, with the company of a cup of coffee or tea. I've taken to storing the leftover in the refrigerator, as much to prevent myself from eating it too quickly as to protect the dense structure and ample fruit moisture. I love how a tangent can take over my food life, winding away over a few days and inspiring me more by the hour. I love having dedicated friends who are up for chatting spontaneously about the best uses for ingredients or which recipe to use or tweak for which occasion... and better yet don't find it the least bit strange when the overwhelming craving for sesame seed hits. Not sure if I ever officially mentioned it here that I broke down and joined Pinterest. You can find me under the same name: rcakewalk. I've been enjoying it, and even more, I enjoy following the whims of my friends and seeing how pins morph and manifest into new inspirations. I'm doing pretty good at going back over things I've saved for later too. Unfortunately, I rarely make things more than once (when cooking and not baking, that is), but this social tool is also helping me remember things that were wonderful, and is a quick reference when I try to recall or share. I probably won't (definitely won't) be adding paper straws to things to photograph, but a pin did lead to my Easter Lamb Cake!